WASHINGTON — Congressman Lamar Smith, vice chair of the House Science Committee’s Space Subcommittee, today participated in a hearing examining the future of America’s space program and the role of human space exploration. Neil Armstrong , Apollo 11 Commander and the first man to walk on the moon, was a witness at the hearing. 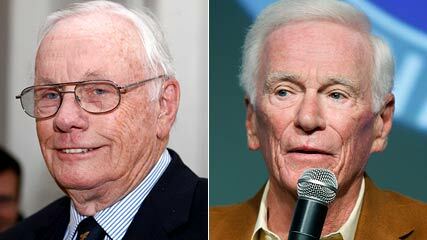 Apollo 17 Commander Eugene Cernan and Dr. Michael D. Griffin, former NASA Administrator, also testified at the hearing. Click here for video of the hearing. Below are excerpts of Congressman Smith’s questions to the witnesses and their responses. Congressman Lamar Smith: What can we do specifically to reclaim America’s leadership in space exploration? Apollo 11 Commander Neil Armstrong: I believe we’re committed to the space station. It’s a commitment with other nations and we must do that and there’s much to be gained from it if we do it properly. Right now we find ourselves in a box where we’re not able to fully man the station and consequently we’re unable to get very much productivity out of it because with the few people that are there they have to spend most of their time just keeping the station operating and there’s little time for the necessary research that is the productive output of the station. That’s unfortunate but true. Second, I share the goal that the moon is the most logical return past near earth orbit and I support that. Apollo 17 Commander Eugene Cernan: I think the first thing we’ve got to do is prove to the rest of the world that we are for real. We’re here to stay. We’re not going to give it fifty years of what we became… We’ve got to first get our tails off the ground and get back into earth orbit and service the space station that we committed to and service the people who we committed access to that space to. Get the shuttle out of the garage down there at Kennedy, crank up the motors and put it back in service. You want a launch vehicle today that will service the ISS? We’ve got it sitting down there. Before you put it in a museum, let’s make use out of it. It’s in the prime of its life. How could we just put it away? Get us back in space. That’s the first thing. And then, once we get that going again and people know that we’re still in the race and still going to run, then let’s a long term program together. Congressman Lamar Smith: Should we be concerned about the Chinese manned space flight program? Are the Chinese pulling ahead of us? Dr. Michael D. Griffin: In my opinion, China understands what it takes to be a great power. We have written the script for them. We were not a great power prior to World War II and since then we have been the world’s great power. They understand that because we showed them how to do it. They are a near peer competitor of ours and I would worry very much about the future of this nation if we were not and if we were not seen by all to be a world leader. When the Chinese can reach the moon and we cannot, I don’t see why any other nation would regard us as a world leader. Congressman Lamar Smith: What are your concerns about the commercial space companies? Dr. Michael D. Griffin: I have a number of concerns. The chief one is we have offered to the commercial space companies which are struggling to get into existence, we have offered them the space station market. But the space station market is small and it’s temporary. We need something more. I firmly believe that with a large enough market commercial space can be successful, initially with cargo and then later with crew. But there is no business case to invest for the space station market alone. We need to have the lunar base market. If there is no business case, then to keep these companies in business will require direct government subsidy, and I am unalterably opposed to direct government subsidy. I am a supporter of commercial space, I am opposed to subsidies.